Free Weekend Quick Tips : Squad – Communicate. Coordinate. Conquer. With the free weekend upon us, we wanted to make sure it was as easy as possible for you all to get in game. The nature of early access and alpha means there may be rough edges, but we have some fixes for common issues new players encounter. How the heck do I join the game? Once you’re in game, hit your Enter key to bring up the spawn and kit selection menu. Choose your role, join a squad, pick a safe place to spawn, and let your squad leader know you’re ready for business! So many buttons. What do? Observe, grasshopper. 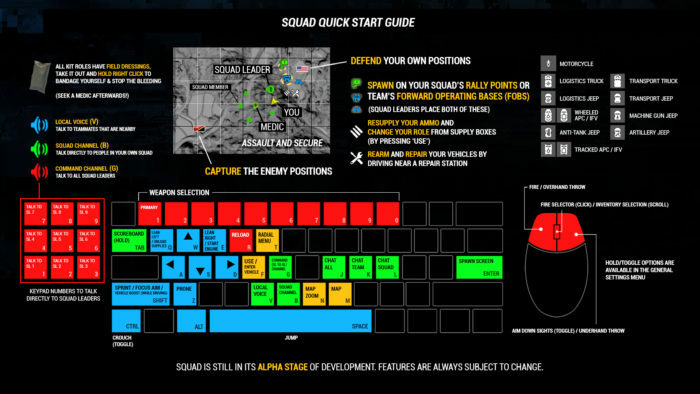 The Quick Start Guide is friend to all squaddies. Our number one recommendation is: be (a little) patient. Loading Squad can take a few minutes on some machines. Installing Squad on an SSD can speed this up. We highly recommending verifying your game data, especially if you already had Squad installed prior to patching. This can be done through game Properties in Steam. There’s an illustrated guide here for your convenience. You may need to whitelist Squad in any antivirus software currently running to prevent crashing or stuttering. I have a thirst for knowledge no quick reference can slake! Well, look at you! You are obviously going places! The first of which should be this guide by SgtHerhi. It has all the information you need to deploy fully prepared.